Living la Noche de San Juan first hand. What an experience. Check out this video for a glimpse of the festivities. Whether you're coming from afar or heading to the coast from inland, get ready to experience an unforgettable night welcoming the arrival of summer. 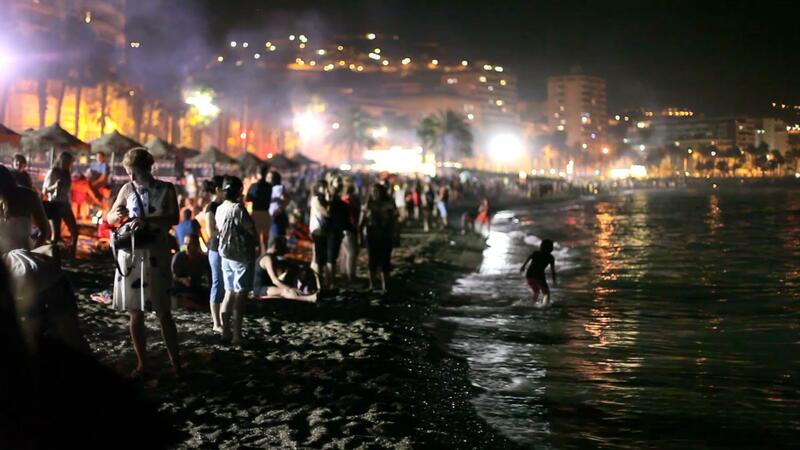 I’ll always remember the first time I was told about la Noche de San Juan, St. John's Eve; I was studying in Madrid and my Spanish teacher described the night he had spent celebrating on the beach in Almería. The next summer I experienced it for myself in Málaga. So what exactly is la Noche de San Juan? In short, it can be described as the traditional welcoming of summer seen along every beach in costal Spain on the night of the 23rd of June. This welcoming of summer involves a little of everything you should expect from summertime in Spain, but amplified. In Spain, people are said to live outdoors, so the start of summer is a huge excitement. Everyone is ready to have fun, be with friends and family, and celebrate with food, drinks, and bonfires. Expect the unexpected. No matter where you are celebrating along the coast, it will be a special experience, but overall it is the people you are with that will define your night. Head to San Juan with friends, family, or join a party of beach-goers. A couple of things to be expected are packed beaches, excitement in the air, music, and definitely bonfires. The bonfires you’ll see are symbolic; some say that the fires are meant to be purifiers and protectors, providing the only lighting needed into the night. They are also said to represent the heat that fills Spanish summers. Another thing to look out for are the lanterns that are released floating into the sky. 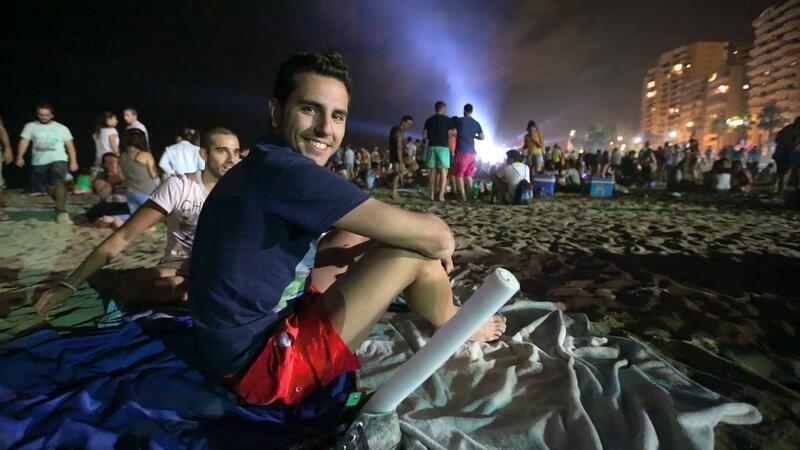 During my first Noche de San Juan, we agreed to meet up as the sun was falling, but it was hard to find each other because everywhere you looked there were people lining the beach, picnicking and buying cervezas and mojitos from nearby chiringuito beach bars. We were in Málaga and I had never seen la Malagueta this packed before, even compared to during the day when tanners line Málaga’s city beaches. At midnight, a very special moment of San Juan begins. This is the releasing of wishes, or juras, into the flames of the bonfires. You’ll see people with pieces of paper, scratching down their wishes and all that they hope to release with the arrival of the new season. Words or sentences are written down, then the pages are burned, disintegrating quickly and symbolizing a cleansing, purification and liberation from the past, and a willingness to look forward to the coming summer, for a new cycle of sun and warmth. Next, crowds run together to the sea to swim, imagining their wishes coming true. Historically, it was prohibited to swim before the 23rd of June, when "swimming weather" was said to start, so this would be the true first swim of summer for everyone. 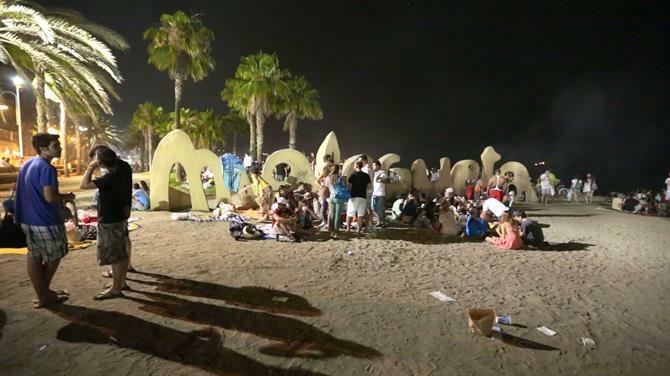 We celebrated on the beach, and at el Club Mediterraneo along la Malagueta, surrounded by music, concerts, and tons of people. Burning our wishes was one of the most special moments of the evening. If you are celebrating in city centre areas, you will have all you need if you bring a bathing suit, towel or blanket, and a pen and paper to write down your wishes. Along beaches near cities, you can buy drinks and food at one of Málaga's best chiringuitos. Music and free concerts also tend to be organized nearby. If you are on a smaller, non-central beach, locals sometimes organize their own fiestas and beach barbecues. This is when it is more necessary to bring food and drinks because there aren’t stands nearby. It is also a good idea to think of bringing wood for bonfires, music, and again a pen and paper for writing wishes. There’s nothing like seeing hundreds of people running toward the sea to have a midnight swim together in the Mediterranean: participating in this is something you need to do at least once in your lifetime. 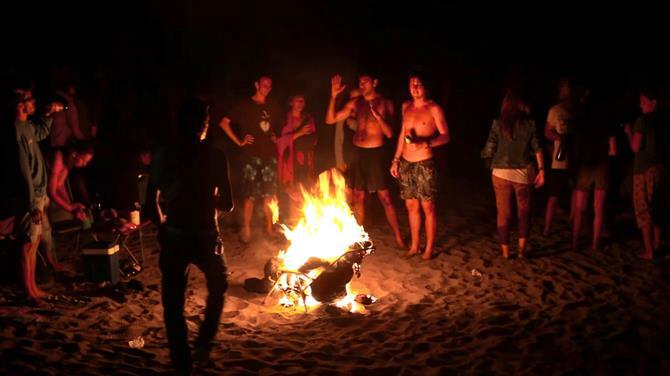 A night of barbecues on the beach, bonfires, floating lanterns, and writing down your wishes and releasing them is something truly unique to Spain, and it is the perfect opportunity to experience a typical Spanish tradition. And what better occasion to attend a beach party than on a night dedicated to welcoming our favourite season. Places to celebrate la Noche de San Juan are vast and any city along the coast will be hosting a party. On this night you’ll definitely notice that there are more people around and that they are migrating in packs to beaches with the necessities for an evening of fun. Follow the crowds and you'll find the celebrations.